To use sweetened applesauce, remove about 3/4 teaspoon of sugar from the measured amount. In a large mixing bowl, combine eggs, milk, cinnamon, sugar, vanilla and applesauce. Mix well. Soak bread one slice at a time until mixture is slightly absorbed. Lightly spray or oil a skillet or griddle. Cook over medium heat until golden brown on both sides. 2 Comments for "Applesauce French Toast"
Have enjoyed preparing this recipe in classrooms with 4th and 5th grade students, they think it is fantastic and many have tried it at home with their families. Extra delicious with diced fresh apples on top. Great recipe. I used skim milk for this recipe and a "no sugar added" applesauce. 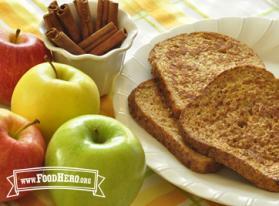 We topped the french toast with either the applesauce or a low-fat vanilla yogurt and finished with a sprinkle of cinnamon. Delicious!